Stunning Music Festivals You Must be Ready to Attend in Russia – Music consists of a collection of sounds arranged in such a way that it contains rhythms, songs, tones, and harmony. Music is an entertainment for everyone. Music is a very unique phenomenon because it is produced from several musical instruments. Music has always been important for everyone. No human does not like music. With various genres, everyone has their own favorite type of music. Afisha picnic is a party held at the end of July or during the summer. Afisha Picnic is the largest, oldest and most famous festival in Russia. This festival is always able to become an international headliner. Although it is only done for one day, in this festival there will be a large market and food court. In addition there are also other interesting activities, namely master classes, auditions, and open-air museums that you can visit. Afisha picnic is in Kolomenskoye, Moscow, or rather in the former Tsar land on the banks of the Moscow river. Afisha’s picnic becomes summer festival in Russia that you can’t missed. Literally, “Nashestvie” means “invasion”. Nashestvie is a music festival that is open to the public. The Nashestvie Festival is also one of the biggest festivals in Russia. The Nashestvie festival contains a stream of Russian creme-de la-creme rock music. The musicians at the Nashestvie festival were people who played many roles in the progress of rock music in Russia. The Nashestvie Festival can be seen in Tyver Oblast, Moscow, on the first weekend of July. The third recommendation for the music festival is Kubana. The Kubana Festival is held annually in Amber Village, Krasnodar in August. The festival, which lasts for 3 days, can attract thousands of visitors to watch spectacular extravaganza music and recreational performances. The Kubana Festival is a music festival that is also rock. In the Kubana festival will be performances from local people or musicians. However, the Kubana festival is able to become a large international festival. After 2015, the Kubana festival was updated with several things changed. Since the beginning of the implementation to date, the Kubana festival has invited several big names such as The Offspring, Infected Mushroom, Korn, and System of the Down. This fourth music festival recommendation has a jazz genre, the coldest music in Russia that is right when you are on a trip with your family. The Usadba Jazz Festival is held between June and July, with place in Arkhangelskoe, Moscow. Not only jazz, in the Usadba Jazz Festival there will be other musical genres. All these musical genres will be combined with jazz, funk, world music, acid-jazz, lounge, jazz-rock, blues, and other contemporary improvisational music genres. This Usadba Jazz Festival has become one of the music festivals that contains the most culture, you will get closer to Russian language with music. Other musical performances at the Usadba Jazz Festival are brass ensembles, playgrounds, vintage-themed exhibitions, designers, and spectacular fireworks displays. For those of you lovers of electronic music, you must watch this one festival. The biggest music electronic festival in Russia when it was formed was still on a small scale. 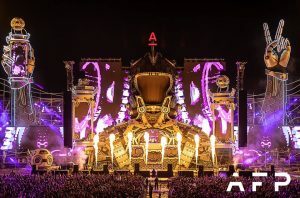 But now, since 2015, the Alfa Future People Festival has become a large-scale electronic music festival that reaches international level, so you will get closer to Russian language with music. This July festival at Nizhny Novgorod is known as one of the best electronic music festivals in Russia. The recommended music festival is the Wild Mint Folk Festival. The Wild Mint Folk Festival is also included in the biggest music festival in its genre. The festival held in Moscow City is a place for all artists to show their abilities in the world of music. The Wild Mint Folk Festival lasts several days and is usually held at the end of June. Various streams of music are found in the Wild Mint Folk Festival, but the flow of folk music is the most dominant. With the flow of folk music at the Wild Mint Folk Festival, you can get closer to Russian language with music. For you lovers of folk music, this festival makes you rediscover yourself. Some folk music that you can watch at the Wild Mint Folk Festival include Balkans, Celtic, Portuguese, Georgia , and genre music such as afrobeat, ethnojazz, reggae, Spanish indie-pop and even Finno-Ugric lamentations. The Wild Mint Folk Festival was held since 2008, and at that time it was a routine music festival. The Wild Mint Folk Festival is very appropriate for the campground atmosphere. Besides music programs, there are also various foods that you can taste at the Wild Mint Folk Festival. The food comes from various countries. You can also take part in other activities in the Wild Mint Folk Festival such as workshops, meditation and yoga. Grushinsky Bard Song Festival is the oldest music festival in Russia. This festival is also the most important music event in history in Russia. The Grushinsky Bard Song Festival was held for the first time in 1968 by displaying Bard’s songs. You can watch the Grushinsky Bard Song Festival in mid-summer precisely at Lake Mastryukovo, Samara. The Grushinsky Bard Song Festival becomes summer festival in Russia that you can’t missed. The stage at the Grushinsky Bard Song Festival is a guitar on a raft. The fingerboard on the guitar is a bridge leading to the beach. The Grushinsky Bard Song Festival has always been able to bring a sense of self interest to young people, especially communal people. From the 7 stunning music festivals you must be ready to attend in Russia, you can choose a music festival according to the flow of music that you like. However, you should also go to a music festival with a different genre, because the entire music festival in Russia has its own position in the international arena.